Ask somebody how they feel after reading or watching an hour’s worth of news, and they’re likely to reply that it makes them feel depressed. It seems that the entire world is in a constant state of commotion, whether due to natural or man-made disasters, which perhaps led to Enoch asking the Lord “when shall the earth rest?” How are we, the Latter-day Saints, to view and react to these events? In response to a statement like this, it is not uncommon for us as a people to cling to the verse of scripture where the Lord instructs us that “if ye are prepared ye shall not fear”. What, then, does it take to be sufficiently prepared such that we do not fear the “fearful destruction” that awaits the world? President Benson once remarked that “As a people, we love sweetness and light, especially sweetness.” For this reason, many sacrament meeting talks, sunday school lessons, and other church discussions regarding the subject of preparedness often place a higher emphasis on spiritual preparedness versus temporal preparedness—if the temporal aspect is even mentioned at all. It’s easier to talk about the “sweet” methods of preparing, such as prayer, scripture study, and temple worship, than it is to talk about storing a food supply, becoming trained in basic first aid emergency response, and setting aside money in our budget to purchase needed items. We thus tend to gravitate towards the “sweet” spiritual side of preparedness, little realizing that by shifting our focus in this way, we are actually undermining our spiritual preparedness. The Lord made clear that the term “temporal preparedness” is in fact a misnomer when used by the Latter-day Saints, since “not at any time [has He] given unto [us] a law which was temporal.” “All things unto me are spiritual”, He further declared, implying that our so-called temporal preparedness efforts are in fact an important subset of our overall spiritual preparedness. Consider a Latter-day Saint living in Haiti. His spiritual preparedness may have helped him acquire needed strength to make it through the aftermath of the recent earthquake that has killed countless individuals and displaced even more. He may have built up enough faith to see him through these trying times, and small miracles may be unfolding before him. This is all good, and he should be praised for his efforts in this regard. But consider further whether this individual was temporally prepared for what has happened. To be sure, his economic circumstances may not have permitted him to acquire food storage and other supplies to the extent that all of us are able to obtain. But God’s commandment to prepare knows no geographical bounds. In the aftermath of this quake, if our fictional friend had on hand a reserve of food, water, and fuel, then he will be able to provide for himself, his family, and perhaps some friends. He will have sufficient energy to serve those around him and alleviate the suffering of others who may not have been as prepared. He can administer to the emotional and spiritual needs of his loved ones and others within his sphere of influence. In short, he can build the kingdom of God. If this person was not temporally prepared, in what condition would he be to serve those around him? Rather than sharing what he has, he would be begging for donations of food and water, or worse, perhaps resorting to the looting that has ravaged the affected areas in Haiti. He would be focusing inward on himself and his loved ones alone, rather than, as Joseph Smith said, “rang[ing] through the world, anxious to bless the whole of the human family.” Instead of being able to build God’s kingdom, he would be entirely focused on his own. How many of you have had wisdom enough to procure and lay up for yourselves produce enough to last until harvest? You may call this a small matter. How many of you have wheat or flour to last you a year? If you are without bread, how much wisdom can you boast, and of what real utility are your talents, if you cannot procure for yourselves and save against a day of scarcity those substances designed to sustain your natural lives? If you have not attained ability to provide for your natural wants, and for a wife and a few children, what have you to do with heavenly things? [Our Heavenly Father] has lovingly commanded us to “prepare every needful thing” (see D&C 109:8) so that, should adversity come, we can care for ourselves and our neighbors and support bishops as they care for others. We encourage members world-wide to prepare for adversity in life by having a basic supply of food and water and some money in savings. When disaster strikes, will we be in a position to care for ourselves, our families, our neighbors, and, through the bishop, others in our community? Suddenly, having a year supply on hand seems relatively insufficient. Our spiritual preparedness is woefully inadequate if we lack the supplies and knowledge that are often classified as being part of our temporal preparedness. Father Lehi spoke of “things to act and things to be acted upon”; by using our agency and choosing to obey the commandment to prepared, we will be in a position to freely act and serve God and His children if and when disaster strikes. In contrast, if we exercise our agency in choosing not to prepare, we will be acted upon during such circumstances as our very lives become dependent on the actions and charitable service of others. Several studies and surveys conducted in the past few decades suggest that the percentage of Saints who have fulfilled the commandment to prepare lies somewhere in the upper single digits. Those of you who have been in this ward for over a year may recall two stake-wide emergency preparedness drills that were conducted in September 2008 and January 2009. Based on the data we received after the second drill, we learned that our stake has on hand roughly three months of food per family, and roughly two-thirds of families have 72-hour kits. While that three months of food per family on average may sound good, a couple qualifiers should be noted. First, that average was inflated by a few families who had a full year or more of food storage on hand, thus “compensating” for the far higher number of families who had nothing, or only a couple days or weeks worth of food. Second, during the most recent drill we asked residents of our neighborhood about their water storage as well, and the results were shockingly low. The number of families who had any type of water storage system in place could probably be counted on two hands. Finally, we did not ask about fuel, clothing, money, or other basic necessities that are crucial items in a well-rounded preparedness plan. Too often we bask in our comfortable complacency and rationalize that the ravages of war, economic disaster, famine, and earthquake cannot happen here. Those who believe this are either not acquainted with the revelations of the Lord, or they do not believe them. Those who smugly think these calamities will not happen, that they somehow will be set aside because of the righteousness of the Saints, are deceived and will rue the day they harbored such a delusion. Do we lose faith, do we lose patience, do we lose hope, do we get weary in waiting, because the day is long and the event delayed? It is difficult to be prepared for an event so long delayed. Many have found it too difficult and they slumber without due preparation. Hundreds of thousands of us today are in this position. Confidence has been dulled and patience worn thin. It is so hard to wait and be prepared always. But we cannot allow ourselves to slumber. Because the Lord is kind, He calls servants to warn people of danger. That call to warn is made harder and more important by the fact that the warnings of most worth are about dangers that people don’t yet think are real… It’s easy to say, “The time isn’t right.” But there is danger in procrastination. In mercy the Lord warns and forewarns. He sees the coming storm, knows the forces operating to produce it, and calls aloud through His prophets, advises, counsels, exhorts, even commands—that we prepare for what is about to befall and take shelter while yet there is time. But we go our several ways, feasting and making merry, consoling conscience with the easy fancy of “time enough” and in idle hope that the tempest will pass us by, or that, when it begins to gather thick and black about us we can turn back and find shelter. It has been asked, and well it might be, how many of us would have jeered, or at least been privately amused, by the sight of Noah building his ark: Presumably, the laughter and heedlessness continued until it began to rain—and kept raining! How wet some people must have been before Noah’s ark suddenly seemed the only sane act in an insane, bewildering situation! To ponder signs without becoming paranoid, to be aware without frantically matching current events with expectations, using energy that should be spent in other ways, these are our tasks. But I am suggesting that the time has come to get our houses in order. There is a portent of stormy weather ahead to which we had better give heed. Let us never lose sight of the dream of Pharaoh concerning the fat cattle and the lean, the full ears of corn, and the blasted ears; the meaning of which was interpreted by Joseph to indicate years of plenty and years of scarcity. Except for another brief reference made in the conference following 9/11, these are the only instances in which President Hinckley spoke in a General Conference regarding Pharaoh’s dream, and these two references stand seven years apart. Despite his disclaimer that he was not prophesying, one is left to wonder whether the Lord was speaking through His prophet to give us our own seven year pattern of plenty and famine. Those who are still employed, well-fed, and living comfortably may scoff at the assertion that we are living in times of famine, but a significant portion of the world’s population likely thinks differently. For example, the true unemployment rate in this country currently stands at 22%; worldwide, the situation looks fairly similar in wealthier countries, while third world countries would welcome a percentage like this with eager, open arms. Global food prices have been on the rise, spurred only in part by freezes, disasters, droughts, crop disease, and other issues. These and a host of other problems have created a turbulent economic environment in which many people are starving, homeless, and hopeless. Being prepared, though, is not simply to be able to better weather the global storms of economic uncertainty. As the saying goes, “when your neighbor loses his job, it’s a recession, and when you lose your job, it’s a depression.” We may very well not be in a symbolic seven years of famine, but this does not mean that we won’t individually face trying circumstances. As evidenced by the Bishop’s recent invitation to increase our fast offerings, there are likely several within our own congregation who have been enduring their own economic depression. Many more people could ride out the storm-tossed waves in their economic lives if they had their year’s supply of food and clothing and were debt-free. Today we find that many have followed this counsel in reverse: they have at least a year’s supply of debt and are food-free. My parents have on three separate occasions been able to ride out those storm-tossed waves in their economic lives by relying on the food storage they had obediently acquired. Despite these three periods of unemployment, each running for around nine months, my parents enjoyed a sense of peace and satisfaction that can only come when one’s previous actions and obedience have prepared them for such times. Their modest savings allowed them to meet their financial obligations during that time, and this result of their efforts to prepare meant that they did not need the assistance of Church funds. Within the last twelve months, the distribution of fast offerings and commodities by the bishops has been alarming. At the present rate of demand, the Church resources will be almost expended in a short time…. It would appear that in altogether too many cases the teachings about preparedness have been either misunderstood or knowingly rejected. Many of our members appear to feel that when difficulty comes, the Church will come to their aid, even when they could have prepared themselves had their priorities been appropriate. Some time ago while visiting two stakes, I saw the evidence of the point I am trying to make. Both stakes were in predominantly Latter-day Saint communities. Both were affected seriously by the same severe but temporary disruption of employment. Generally, when I arrive in a new community for stake conference, I drive around the neighborhood or countryside to get a feel for the kind of people who live there. For example: Are their yards well taken care of? Are their homes well cared for? Are there old dilapidated barns and outbuildings, or are the properties neatly maintained and fenced? In other words, how much pride do the people have in themselves and their community? In the first stake I refer to, I saw well-cared-for homes and yards. It seemed that this was a prosperous, so-called middle-class area. Some would have thought it an affluent area from the number of recreation vehicles in the driveways—boats, campers, and motor homes. As I met with the stake presidency, I commented on the apparent prosperity of the people. However, when reviewing the welfare needs of the people, I was shocked to see the demands made on the fast-offering funds and the bishops’ storehouse. The stake president informed me that within a week or two of the closing down of the major employer, many families came to their bishops for assistance. They had very limited reserves from which to take care of themselves. He also mentioned there were some faithful members in his stake who from their reserves had taken care of their own needs as well as assisting some of their neighbors. In the second stake, which was some distance from the first but which was impacted heavily by the same employment problem, I saw few recreation vehicles. As a matter of fact, I saw little evidence of affluence, although the properties were neat and tidy. Here I was surprised to see practically no fast offerings or bishop’s orders being used. I asked the stake president if his bishops understood and were discharging their responsibilities for the poor and those in need. He indicated that, while some families had needed to seek assistance from their bishops, most of the members recognized their responsibility for their own welfare and were prepared to take care of themselves. You see, the priorities of the members of these two stakes were very different. Many in the first stake were not prepared and expected the Church to take care of them, while in the second stake the situation was reversed—the majority of the people had prepared to meet their own needs. Brothers and Sisters, how would Bishop Brown classify our stake? Are our families ready to weather the economic storms of life, whether generally or individually felt, or will we be a drain on resources and dependent upon others’ charity? Are we like the foolish virgins who clearly knew they needed to prepare and yet did not, or are we like the wise ones who remained alert and ready for future events? …the welfare program rests on the basic principle of personal and family preparedness, not on Church preparedness. We are concerned that because the Church program includes production projects, canneries, bishops’ storehouses, Deseret Industries, and other visible activities, our people are mistakenly led to believe these things replace the need for them to provide for themselves. This simply is not so. The evidence that this illusion exists is seen in the experience of the last few months as the draw on fast offerings and storehouse commodities has spiraled. We are very much aware that we live in difficult times, perhaps as difficult as any recent period in history. The economy in general seems to be out of control; there is high unemployment in many areas. Inflation is running rampant in most countries of the world. Personal debt is staggering… Many who have purchased a home have monthly payments which leave no room to handle the slightest emergency. We have been taught that we should build our reserves over a period of time, that we should not go into debt to do so, that we should buy those things we use and use them on a rotation basis, that we should use common sense in preparing ourselves to be independent and self-reliant. There has never been extremism or fanaticism associated with these teachings. It is the opinion of many that more difficult times lie ahead. We are deeply concerned about the welfare of our people and recognize the potential privation and suffering that will exist if each person and family does not accept the word of the Lord when he says, “Prepare every needful thing” (D&C 88:119), and “It must needs be done in mine own way” (D&C 104:16). Should the Lord decide at this time to cleanse the Church—and the need for that cleansing seems to be increasing—a famine in this land of one year’s duration could wipe out a large percentage of slothful members, including some ward and stake officers. Yet we cannot say we have not been warned. It is important that we remember the Lord’s declaration that “I, the Lord, am bound when ye do what I say; but when ye do not what I say, ye have no promise.” We cannot expect God’s help when we have chosen to ignore the counsel of His servants time and time again. God will protect and bless those who have been heeding His voice. Just as it is important to prepare ourselves spiritually, we must also prepare ourselves for our temporal needs. … We have been instructed for years to follow at least four requirements in preparing for that which is to come. Fourth, acquire and store a reserve of food and supplies that will sustain life. Obtain clothing and build a savings account on a sensible, well-planned basis that can serve well in times of emergency. 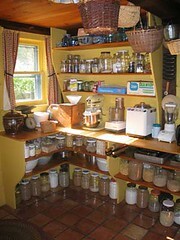 As long as I can remember, we have been taught to prepare for the future and to obtain a year’s supply of necessities. I would guess that the years of plenty have almost universally caused us to set aside this counsel. I believe the time to disregard this counsel is over. With events in the world today, it must be considered with all seriousness. Brothers and Sisters, my invitation to each of us today is to consider the counsel I have shared with seriousness. Make a firm resolve to repent where necessary, and strive diligently to obey these commandments. Take seriously the prophecies for the future and the divine responsibility we have to care for ourselves and our families, both now and in the future. I invite you to prepare so that you shall not fear. I testify of the peace of mind that comes from obeying this counsel and laying up in store the supplies that can help us weather the storms of life. How Prepared is the Average Latter-day Saint Ward? "Why the Latter-day Saints Prepare"